This was a childhood favorite of mine and when it was added to Netflix I had no choice but to watch it and see if it is all that I remember. And it kind of does, but in some ways not so. 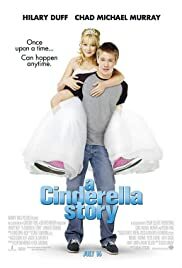 I remembering loving Hillary Duff in my youth, but after watching this again....she could not act. Okay, that is not fair...she is okay. Her voice is annoying now. She always sounds whiny and it grated on my nerves after a while. She should've just stuck with TV shows. I loved the step mother and the step sisters. They were hilarious. This is a cute film and I still liked it. It is a classic for me and it really does have a good message. Sure...look for true love, but it is not essential to better yourself. Do not rely on him (or her) to save you. Be true to yourself and happiness will follow. If you are looking for a sweet but meaningful little movie this is for you. I'll give this 3 stars.